For over 40 years, Roper Whitney has been producing quality folding systems for a variety of markets. Building on that experience, the newest generation Autobrake folders integrate advanced wing bending design with the features that have made the Autobrake the choice of professionals..
Manufacturing, service, and applications support are based in Rockford, IL U.S.A. Benefits of the Generation "2"
Work pieces are fully supported by the table beneath the clamping jaw, and automatically positioned to an accuracy of +/- .004" by the computer controlled automatic gauge. Sheets up to 700lb. (318kg) can be accommodated. Maximum 61" (1550mm) back gauge travel in less than 3 seconds is provided by our three stage design combining high speed with compact space requirements. Operation of the pop-up fingers is controlled by the integrated air system. Air supplied to the back gauge fingers must be clean and filtered with an operating pressure of 80-100 psi. The gauging system is constructed of heavy duty yokes riding on dual linear ways. The back gauge is driven by a servo motor for low noise operation and precision ball screw for high levels of accuracy. The servo motor automatically recovers from back gauge displacements as high as .625 inches. The 14 conveniently spaced fingers provide positive contact with the sheet edge at all times and have a minimum back gauge position of 0”. Powered by U.L. Labeled (Underwriters Laboratories) electrics, the Titan control system combines the capabilities of Roper Whitney's pendant control systems with new features for a quantum leap in productivity and power. The Titan system enhances the skills of the sheet metal fabricator by providing the means to quickly transfer the operator's knowledge into useful part programs. Windows-based software is combined with a powerful machine controller, specifically designed for the Autobrake. This system delivers a high powered stable solution for all folding needs. The Titan software comes packaged within an Intel® Pentium® computer combined with a 15” flat panel display for high speed system response, and easy viewing of the operator interface. The computer system is pre-configured for connection to an inter-office network. The computer is housed within a sealed oil-tight enclosure to prevent dust and water contamination. The front of the enclosure hinges open with the computer attached, giving access to the USB, serial, and network connections. • The Titan Control integrates the operation of the positioning gauge, bending leaf, and clamping mechanisms, and has the capability to store over one million part programs. The Titan system provides greater flexibility to the operator with fewer keystrokes, resulting in a user interface that is easy to learn, and increases productivity. Creation of part programs can be done by text entry in the main operations screen, or part profiles can be drawn and converted into programs. Both part programs and drawings can be stored on the computer's hard drive for future use. Part profile drawings are created in vector format, allowing the part to change its shape and size dynamically as bend angles and line lengths are altered. Parts can then be visually verified as correct prior to creating the part program. Bends can be inserted, deleted, or altered as the operator desires. Therefore, stored profiles can be changed into other types of shapes on demand. Hem and radius macros can also be used to create architectural shapes, or other curved forms. Part programs and drawings are stored and accessed from the memory using a flexible Windows based file handling system. Programs can be stored in any number of directories for easy organization according to any factors desired, such as: customer name, product name, part type, etc. Program file names can be any combination of letters or numbers, allowing programs to be identified by part form, company part number, or any other criteria desired. Programs created using the drawing portion of the Titan system show a small picture of the part for quick program identification. Incorporated into the file system is a quick search tool that allows programs to be displayed by key portions of their names. This limits the selections displayed, and speeds program access for the operator. The Titan system also includes a file transfer screen that allows selection of multiple programs and drawings, and their transfer as a group from any directory or drive to another. A hot key is provided to return the file display to its "home" position, reducing time to access part programs. The quick search tool is also present to assist in the file transfer process. The control system includes several backup features. The setup parameters that control the operation of the Autobrake can be stored at any time to a file name. These settings can then be retrieved as needed to maintain correct machine performance. This provides a fast secure method to reestablish the parameter settings due to any disruption. Once per month the operator is reminded to make a complete backup of the Titan software system. This backup stores all of the critical system settings, part programs, and part profile drawings present in the Titan operation directory. Each backup made is stored separate from the next, providing a history that can be accessed if needed, and preserving the operator's part programs. Backups are placed in a USB flash drive connected to the computer control head, or may be directed to another drive; either local or network. The Autobrake is a plate and weldment steel construction, delivering superior performance and features in a simplified rigid design. End housings are a plate-type construction bringing drive components close together for improved stiffness and performance. Actuating mechanisms are secured in rigid mounts at the outside of the housings, allowing easy maintenance. The unique Kombi beam is a fabricated structural prism on which is mounted tooling to firmly clamp a broad range of materials and withstand the forces generated by capacity forming operations. Machined into the Kombi beam 180° from each other are the attachment surfaces for the straight and box and pan tooling. Tools are attached to the Kombi beam with standard socket head cap screws and grooves are provided to secure the tools even while the clamping bars are loosened for adjustment. Rotation of the Kombi beam is powered by a brake motor driving a sprocket and roller chain mechanism. The upper beam is driven to programmed settings on both ends by a brake motor and eccentric drive of the beam with a connecting shaft. Clamping and hemming power is delivered to the clamp jaws by a series of spring washers to provide variable clamping pressures with a shock-absorbing end stop. This provides reliable clamping pressure regardless of material thickness. Integral to the upper beam are the ways with non-metallic gibing to guide and retain the upper beam within the end housings. Actuating members rotate the bending beam into position from both ends of the machine, using a variable speed drive (VSD) for accurate control over programmed bend angles. Mechanisms are mounted within reinforced connections for improved performance. The lower beam is a welded reinforced structure fabricated of thick steel keyed into the end housings. The lower beam is pinned in place, and close-coupled to the end housings and upper beam for improved rigidity. The advanced design of this beam delivers superior hemming results. The folding beam consists of a thick plate for maximum resistance to bending forces with a machined seat to receive the standard .787" (20mm), .390" (10mm) or .275" (7mm) bending blades. A micrometer nut allows adjustment for large variations in material thickness. Operating mechanisms of the Autobrake are enclosed within attractive end covers. Each cover is equipped with lift points for easy removal from the machine, presenting all moving parts for easy maintenance. Covers are nested on tapered mounts for easy attachment to the ends of the machine. right-hand side of the machine. The computer control can be rotated into position for best use, and can be positioned to the rear of the machine. Access to the Autobrakes’ electrical system is located at the right-hand portion of the machine through a quick- lock enclosure. This enclosure houses the power and control devices that drive the machine, and extends behind the right-hand cover for reduced machine length. The angular shape of the covers and advanced machine design provide a smart modern appearance to the Generation "2" Autobrake. A standard feature of the Autobrake, the Variable Speed Drive system delivers advanced positioning of the bending beam in radius forming applications. This system provides precise control over the small angles used to produce these radius forms. Standard bends are also enhanced, yielding bending accuracies of + 1/2 degree. The system includes a variable speed drive, DB resistor assembly, installation, and testing. The CNC control system on the Autobrake is equipped to control and monitor the VSD system, and allows adjustment of the reduced speed settings to accommodate the customer's application. Folding beam crowning is standard equipment on the Autobrake. This system consists of crowning cams, actuating tool, and interfacing features on the machine's bending beam. The system provides a quick easy method for adjusting the center crown of the bending tooling to improve bend accuracy, and adjust the work material straightness when forming radius bends. The system is manually adjusted, and locked in place by the operator. The Roper Whitney Autobrake Folding Machine is offered in a range of models from 4 feet to 13 feet , and capacities through 1/4" steel , the Autobrake 2000 folding machine is designed to meet the needs of job shops, metal roofing contractors, and architectural sheet metal fabricators. 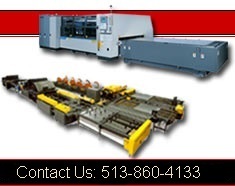 These CNC metal folding systems incorporate automatic gauging, clamping, and pivot bending for versatile, efficient part production. Bending and gauge positioning accuracy alllow a wide range of parts to be fabricated with repeat precision. Computer Controlled Auto Brake- Flexible, powerful, and easy to use makes the Orion control system a must have for any sheet metal fabricator. This all new Windows® based controller was specifically designed for the Autobrake Folding Machine and uses a touch-based graphical user interface for quick editing and creation of part programs. With minimal training, operators can quickly learn to dynamically generate part drawings complete with up-to-date bend angles and lines, material handling instruction, plus hemming and radius macros. An internal modem allows our technicians to troubleshoot your Orion Control using a phone line. Dual Clamping System- Clamping pressure is easily programmed at the control without manual adjustments allowing soft and painted materials to be held without marrign. The Roper Whitney Autobrake Folding Machine is activated by footswitch through a unique spring loaded system, and driven from both ends, clamping ressures approaching 40 tons are achieved. Powerful Bending System - Folding of the part is accomplished by a rotating beam driven from both ends by heavy duty low-friction roller chains with an automatic tensioning device for low maintenance. Accuracy of the bend is ensured by encoder feedback attached directly to the rotating center of the bending beam. Universal Tooling - Every Roper Whitney Autobrake comes with continuous upper, lower, and bending tooling included, as well as a complete set of box and pam (Kombi) tooling (1" through 24" widths).Specialty tooling, while seldom needed, is also available to meet your needs for every Roper Autobrake 2000 folding machine. Patented Kombi™ Beam - Found only on the Roper Whitney Autobrake, this patented upper beam allows both straight full length bending box work without changing tools.The box tooling is mounted on the reverse side of the beam and rotated into position in a fraction of the tool change over time required with other systems. Angles, raduis bends, and hems all can be formed with the Autobrake Folding Machine without any additional tool setup during part production. CNC Backgauge -Multiple sets of steps are provided for fast accurate positioning of the work material without pre-measuring or scribing of the sheet. Low profile spring stops in the forward position allow gauging between the clamping jaws for short flanges without marking soft materials. 61" backgauge and can also be added to machine already in the field. right or left side but needs to be specified when it is ordered. The optional complete 12' backgauging system has to be specified prior to ordering an Autobrake. This system consists of a complete backgauge table that is 12' in depth as well as 12' in width. A squaring arm can be added to any backgauge to help in gauging narrow parts. use one or backgauge fingers to accurately gauge narrow pieces.